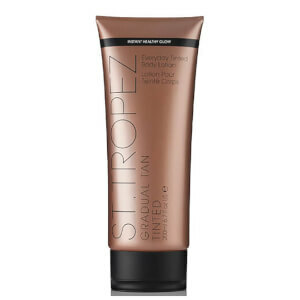 Achieve a sun-kissed glow with the Gradual Tan Classic Lotion from St. Tropez. Easy to apply, the lightweight lotion delivers an instant hint of bronze with a streak-free finish, whilst slowly intensifying to leave the body with healthy-looking, golden colour. Infused with aloe vera to soothe and moisturise the skin, the fast-absorbing lotion develops over 4-12 hours to leave you with a deep, long-lasting tan, whilst innovative Aromaguard™ Fragrance Technology banishes the unpleasant fake tan smell. Suitable for all skin tones, you can re-apply daily to build your desired depth of tan. E.N. Aqua (Water), Caprylic/Capric Triglyceride, Aluminum Starch Octenylsuccinate, Butylene Glycol, Cetearyl Alcohol, Dihydroxyacetone, Cetearyl Glucoside, Glycerin, Isononyl Isononanoate, Cyclopentasiloxane, Hydroxyethyl Acrylate/Sodium Acryloyldimethyl Taurate Copolymer, Cyclohexasiloxane, Ethoxydiglycol, Ceteareth-20, Phenoxyethanol, Saccharide Isomerate, Parfum (Fragrance), Caprylyl Glycol, Polysorbate 60, Sorbitan Isostearate, Pentaerythrityl Tetra-Di-t-Butyl Hydroxyhydrocinnamate, Linalool, Hexyl Cinnamal, Benzyl Salicylate, Butylphenyl Methylpropional, Citronellol, Limonene, Geraniol, Hydroxycitronellal, Citric Acid, Sodium Citrate, Alpha-Isomethyl Ionone, Anise Alcohol, Coumarin. I've been using this for years, and it's so far the best self tanning product I've tried. I just love this one! It gives such a great natural color and it applies beautifuly. I will continue using this!! 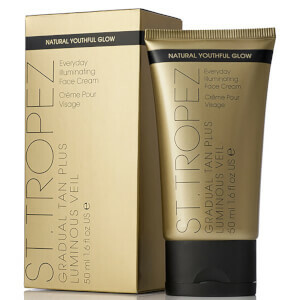 This is my third bottle of St Tropez, I like the way my skin feels, I like the smell, very pleasant odour. Very natural colour. Very pleased will continue to buy.